I have been trying to paint more abstractly and seem to always end up with a horizon line and a landscape based paining. So I had an idea based on something someone said in a class one time. We took a mat frame and found parts of paintings that could be stand alone paintings. So I decided to try this with Photoshop and some of my landscape based abstract paintings. I chose a square format and cropped a square on a painting on Photoshop and moved it around until I had a composition I liked. Then I chose it and made it bigger and printed it on my ink jet printer. I did this with 4 or 5 different paintings. Then I used one of the compositions to start a painting. I chose a 36″ x 36″ canvas. I usually start with a textured acrylic medium underpainting and bright acrylic inks over that. When these 2 layers were dry, I began using a palette knife to rough in the areas of the close up I had printed. The next step was to paint without any references, using the painting itself to be my guide. After many layers, I stopped when I thought the composition and colors looked right. As an example, here you see on the left one of the Close Ups I painted, and on the right you see the original painting that is was based on. 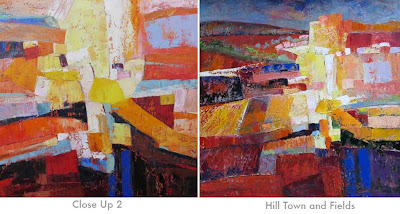 The first named Close Up 2 is the square re-framed interpretation of the painting named Hill Town and Fields. You can see more of these new square “interpretations” at the Members show now currently up at Frank. It will be there for your viewing until May 6th, so stop by! See this websitefor other views of her work.